Norwegian Escape has been officially named at PortMiami, Florida. The new cruise ship shined in all its glory under the vivid blue Miami sky. It was a Christening ceremony to remember where international superstar, musician and now Godfather Pitbull named the 164,600 gross ton ship on a typical sunny afternoon in Miami, Florida. There was an important but also grand speech from Norwegian’s CEO Frank Del Rio along with plenty of performances and shows to keep the attendees entertained. We especially liked the large “Escape” letters at the back of the stage. Attendees were treated to a special sneak peek at the stellar entertainment Norwegian Escape has to offer as the casts of Tony Award-winning Broadway shows “After Midnight” and “Million Dollar Quartet” performed a selection of songs from each respective show, before Pitbull brought down the house with his hottest hits, including “Don’t Stop the Party”, “Fireball” and “Give Me Everything”. There was a slight hiccup, the live feed on Periscope which NCL had been promoting so much in the days leading up to the big event failed. Many people trying to watch the live feed got frustrated by a slow connection which was constantly cutting off. With shaky footage and constant failures on the feed many posted on Twitter their frustrations. 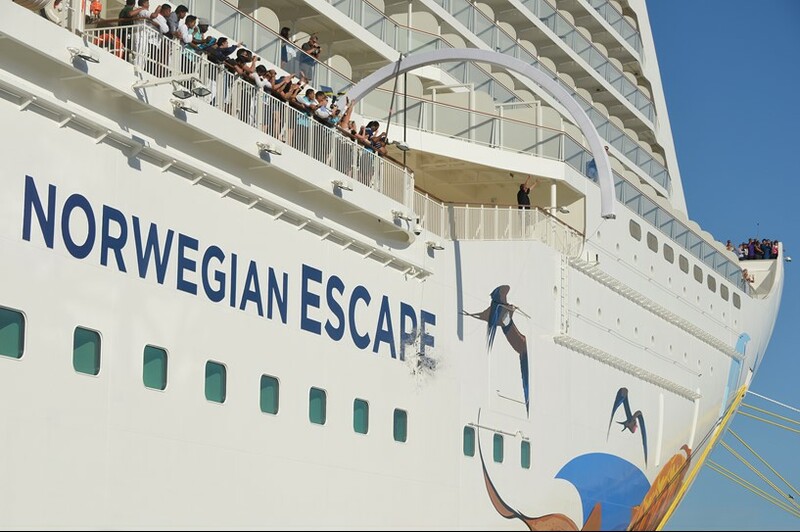 @CruiseNorwegian Congrats on #Escape …your live #periscopes need some work. Lots of bummed viewers ?? No doubt that NCL will be posting highlights of the ceremony and performances so not all is lost and with such a breathtaking cruise ship who can’t be happy! Norwegian Escape will now showcase cruisers in Florida and beyond industry first features including the Snow Room and Jimmy Buffets first ever Margaritaville at sea. After a 3-day special cruise to the Bahamas and back the 4,248 passenger vessel will commence its Eastern Caribbean deployment out of Miami. The ship will sail weekly cruises including calls to St. Thomas, U.S. Virgin Islands; Tortola, British Virgin Islands; and Nassau, Bahamas. The first voyage will set sail on November 14.